What’s cuter than a baby bum rocking a cloth diaper? When you add a dino tail to that tush! 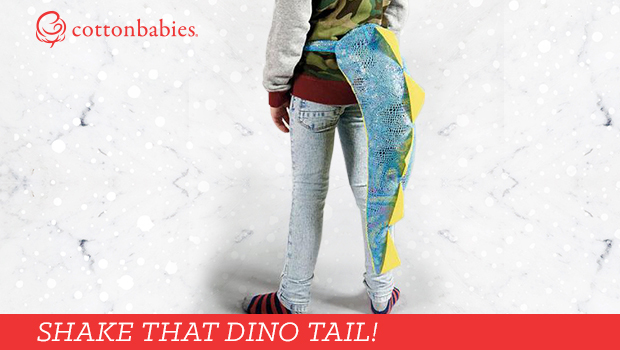 We are head over tails for these adorable dino tails. They’re colorful, vibrant and perfect for shaking that little booty. Of course, these tails are popular with toddlers and preschoolers who can really move around and explore. Your little one will have a rawr-ing good time going on prehistoric adventures while wearing a dino tail. Besides dino tails, you can also get your hands on some adorable mermaid tails as well. Who doesn’t love imagining an under the sea adventure or swimming in far off places? With these tails, your little one can dream up their very own tale in a far off place(pun intended!). Imaginative play is important for young growing minds. It helps them expand their world and tap into their creativity. Role playing with friends can help develop their social skills. By providing props that pique their interest, you can encourage these play patterns.